You don't need to travel far to conjure up some interesting observations. Just by being around and about the garden throughout the day, and pausing now and again to glance up, I managed to record a second record for the garden (a Peregrine that circled high for a couple of minutes before being lost to view), my earliest ever Holly Blue and a steady dribble of Common Buzzards that headed south to south-westwards. 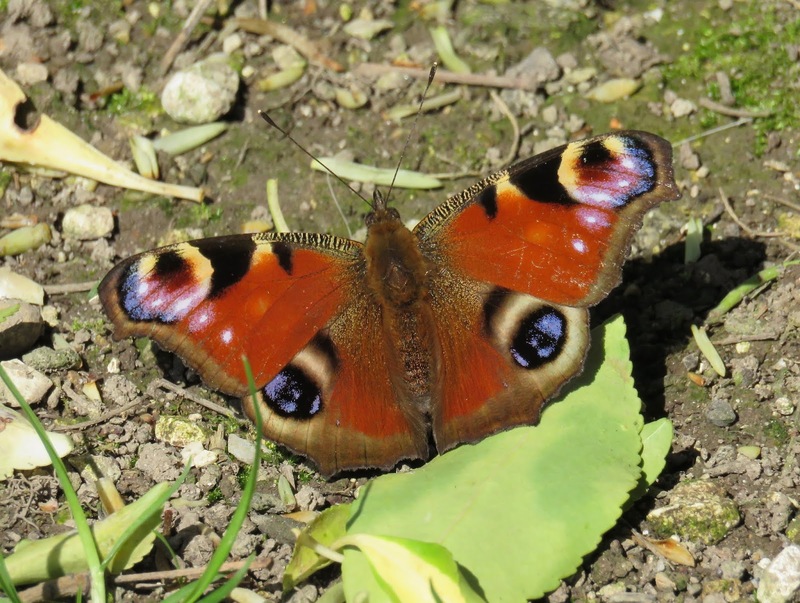 I also paid my respects to a Peacock that alighted momentarily on a patch of earth (above) - I don't think that there is a butterfly that can beat it. Saw my first peacock of the year the other day too, at Ide Hill. Beautiful. Haven't seen a single brimstone yet this year! C'mon Adam, pull your finger out! Btw, are you hoping to get to the new WHL this season? I'm looking at the Huddersfield game, but happy to bide my time. I was at Wembley for the Dortmund match... a memory I still cherish despite the awful results since.